Human rights group criticizes plan to use "potentially lethal electrical weapons"
LONDON, England (CNN) -- The British government is buying 10,000 Taser stun guns for police officers across England and Wales, Britain's Home Office said Monday. 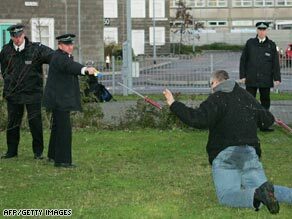 British police officers use a Taser gun to tackle a mock suspect in a training exercise. The move will expand the ranks of officers carrying the weapons from "select firearms squads" to "thousands of trained frontline officers," according to the Home Office, which is responsible for domestic policing. Home Secretary (Interior Minister) Jacqui Smith said police "deserve our support, so I want to give the police the tools they tell me they need to confront dangerous people. That is why I am giving the police 10,000 Tasers." The guns fire barbed darts charged with enough electricity to stun a person, the Home Office said. But Amnesty International UK described them as "potentially lethal electrical weapons" that deliver "50,000 volts of electricity into a person's body. The result is excruciatingly painful, causing a person to fall to the ground and, at times, lose control of their bodily functions." The human rights group, however, expressed qualified support for the British government move, urging that the weapons be given only to officers specially trained to use them. "We don't actually oppose the use of Tasers as long as it's by a limited number of highly trained specialist officers, responding to genuinely life-threatening or very dangerous situations," said Oliver Sprague, the organization's arms program director. But, he added: "Tasers are potentially lethal weapons which are already linked to numerous deaths in North America and that's why wide deployment without adequate training is a dangerous step too far for British policing." "The home secretary should urgently review this decision and ensure that Tasers only end up in the hands of a small number of fully trained officers capable of making the potentially fatal decision over whether to fire 50,000 volts into a person's body." Amnesty says more than 300 people have died after being shot with Tasers since 2001. The decision to introduce Tasers across England and Wales follows what the government called a successful pilot program with officers from 10 police forces, including London's Metropolitan Police and forces responsible for Liverpool and Bristol. The test ran for 12 months from September 2007 with constables who had not previously carried firearms, a Home Office spokesman said. Before the pilot program, approximately 6,000 specially trained firearms officers across the country had access to Tasers starting in 2004. Most British police officers do not carry any kind of firearm, Home Secretary Smith emphasized in her statement, a fact she said she was proud of.